White-nose syndrome, a bat disease that has spread to 23 states and killed up to five million bats since 2006, has been confirmed in Wisconsin, according to officials from the Wisconsin Department of Natural Resources. Results from visual inspection and genetic and tissue tests completed in early April showed that 2% of bats in a Grant County mine have the disease, named for the characteristic white fuzz on their nose, wings, and tails, according to Erin Crain, who leads the Department of Natural Resources’ Natural Heritage Conservation Program. Caused by the fungus Pseudogymnoascus destructans, white-nose syndrome is an infection of the skin of the muzzle, ears, and wings of hibernating bats. The fungus affects the respiratory system of hibernating bats, causing them to frequently awaken, thereby depleting their energy stores and increasing the chances that starvation or dehydration will kill them before spring arrives. Up to 95% of bats in infected caves and mines in other states have died from the disease. It does not affect people or other animal species. DNR bat crews had been wrapping up winter surveillance efforts for 2014 when they discovered eleven individual bats with the classic signs of white-nose syndrome in the Grant County mine. The mine is within flying distance for bats from a site in Illinois where white-nose syndrome had been confirmed in 2012. Bats play an important role in nature by eating many species of insects, including those that can damage forests or transfer diseases like West Nile Virus. Wisconsin is home to several of the upper Midwest’s largest bat hibernation sites and historical estimates have put the population at between 350,000 and 500,000 bats. At this time, the discovery in the Grant County mine appears to be an isolated occurrence, and cave and mine owners across the state have been notified of the disease-positive site. The Wisconsin DNR’s visual surveys of 85 other mine and cave sites this winter did not find any other signs of white-nose syndrome. However, the DNR is awaiting results from routine genetic tests underway on samples collected at nineteen of those other sites. DNR officials will be meeting with external white-nose syndrome science and stakeholder teams to discuss the finding and how best to proceed based on data collected this winter. The teams are advisory and will forward management recommendations to the DNR for consideration, according to Crain. 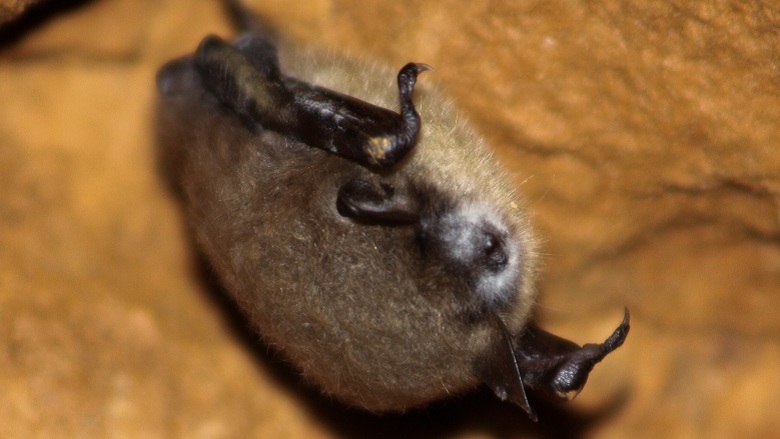 Most Wisconsin caves that serve as bat hibernacula have been seasonally closed to the public for several years as part of measures the DNR has taken to give hibernating bats the best possible chance of avoiding the disease. Voluntary prevention agreements are in place with owners of private and commercial caves and mines open to human access, and recreational cavers a required to follow decontamination procedures to prevent transmission of disease between sites. But more must be done to stop the spread of white-nose syndrome to Wisconsin’s cave-dwelling bat species, which are already listed as threatened (a status that makes it illegal to kill them or take action that would result in their death). Wisconsin citizens can help bats by not disturbing them, especially during hibernation season, by following all decontamination requirements when entering caves or mines, and by volunteering to monitor bat populations. “Now more than ever we need Wisconsinites’ help to keep our bats as healthy as they can heading into next year’s hibernation period and the challenges they will face,” Crain says. Learn more about bats and volunteering opportunities on DNR’s Bat Program website, found at wiatri.net/inventory/bats.